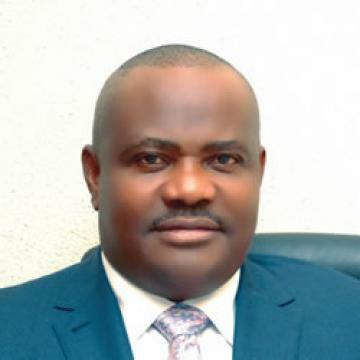 Governor Nyesom Wike of the People's Democratic Party has urged security operatives to arrest and investigate some suspected outlaws operating in the oil-rich state of Rivers. In furtherance of his efforts to stem the tide of crime and violence in Rivers State, Governor Nyesom Wike has given marching orders to security agencies to hunt down cult leaders terrorizing the state. Governor Wike in a comprehensive list released during his state wide broadcast on the killing of Don Wanny, said security forces should not spare any of the listed suspects. He said the suspects have refused to take advantage of the Amnesty offer of the state government thereby causing mayhem in different Local Government areas of the state. The Rivers state Governor also announced a twenty million naira bounty for anyone who offers information about the whereabouts of the suspects. Wike in the broadcast further blamed the All Progressives Congress led by the Minister of Transportation, Rotimi Amaechi for allegedly dissuading some cult groups from accepting the state’s amnesty. He also accused Amaechi of politicizing the security situation in the state just as he revealed that the Anti-kidnapping Law will be amended to prescribe death sentence for criminals in Rivers state. On the first of January 2018, the entire State and the country at large was traumatized by the callous murder of 23 innocent persons at Omoku in Ogba/Egbema/Ndoni Local Government Area by the notorious cultist, kidnapper, terrorist and murderer Don Wanny and members of his doomed gang. 2. When I visited the families of the victims, I placed a prize tag of N200 million for any information that could lead to the arrest and prosecution of the perpetrators of this most heinous crime against humanity. 3. I also assured the security agencies of our further determination to continue supporting them with whatever it would take to have these criminals apprehended and brought to justice. 4. Yesterday, 7th January 2018, we all received the news about the death of Don Wanny and two of his fellow gang members in their hideouts in Enugu State while trying to escape arrest from the security agencies that were closing in on them. 5. Although we would have wanted Mr. Don Wanny and his gang members to have been arrested alive and put to trial for their numerous crimes and atrocities against his own people. His death, nevertheless, is a huge relief to the entire State, and therefore, most welcome development. 6. For years the security situation in Omoku in particular, and Ogba/Egbema/Ndoni Local Government area in general, has been most challenging because of the criminal activities of Don Wanny and his gang. 7. We therefore wholeheartedly thank President Muhammadu Buhari for rising to the occasion and not politicking with the issue of security. We also commend the security agencies, particularly, the Nigerian Army and the Department of State Security, for swiftly rising to the challenge in the most professional manner. 8. There is no doubt that this heroic success has proven what is possible when our security agencies are willing to discharge their constitutional duties with unadulterated commitment and professionalism. 9. Since 2015, we have been calling for tackling security issues devoid of political considerations in Rivers State in order to achieve maximum result. This level of commitment and professionalism as demonstrated in the Omoku case is exemplary. Therefore, we will continue to demand no less from our security agencies to keep our State safe and secure for residents, visitors and investors. 10. As a government, we have invested heavily on the security of the State and will continue to do everything within our powers to guarantee the security and safety of lives and property throughout the State. As a fact, we will spare no cost in ensuring that nobody will have peace if the lives and property of our people make no meaning to them. 11. However, we are deeply worried when our investments in security are deliberately prevented from yielding the desired results due largely to the recurrent tendency to politicize the federally controlled security agencies and services in the State. This is the reason why we must thank the President for doing things differently and with the support of all, a different result has been achieved. 12. The aftermaths of crime and insecurity affect society as a whole, and not only the direct victims. Accordingly, the duty to fight crime and criminality remains collective and no right thinking person should ever indulge in politicizing security issues under any circumstance. 13. In deed, at a time such as this, we expect political leaders to eschew political sentiments in their reactions and utterances and join forces with the State Government to address the situation and bring justice to the victims. 14. Regrettably, instead of showing respect for the dead and genuine sympathies to the bereaved families, the leader of the All Progressives Congress and former Governor of the State prefers to exploit the unfortunate incident for political ends by disseminating wild, unguarded and inciting statements to the unsuspecting public. 15. Contrary to his false claims and posturing the security challenge in Omoku predated our administration and Rivers State was never peaceful when he held sway as Governor. In case he has forgotten, this same Don Wanny tragically killed 32 persons in Omoku on the 14th of December 2014 under his watch as Governor. Yet, he failed to bring Don Wanny to justice. 16. We reiterate our zero tolerance for all forms of criminality and reassure all residents of our determination to be tough with those who choose to violate our criminal laws and undermine peace and security in the State. 17. To underscore the seriousness we attach to the fight against violent crime, we shall be amending the Anti kidnapping law to prescribe the maximum sentence for engaging in cultism, robbery and kidnapping. 18. Our decision to offer amnesty to all repentant cultists, militants and criminals was done in good faith and in the best interest of the State. Regrettably, while the programme was on course, the former governor and his ilk dissuaded some of these criminals from sincerely embracing the amnesty. The result is the recent escalation of cult and criminal activities in parts of the State. 19. At all times, our position on the amnesty offer is clear: those who genuinely embraced the offer are bound to fully, completely and perpetually renounce all forms of criminality and be of good behaviour in order to enjoy terms of the amnesty. The full weight of the law will be released on those who failed to embrace it. 21. The Rivers State Government will pay N20 million to any person who volunteers useful information that would lead to the arrest and prosecution of any of the afore-mentioned persons. 22. Finally, we wish to reassure Rivers people once again of our commitment to support the security agencies to guarantee the safety and security of lives and property across the State.